Property developer I-Bhd is planning to launch “Internet of Things” (IoT)-ready serviced residences in i-City, Shah Alam in June, said marketing director Monica Ong. 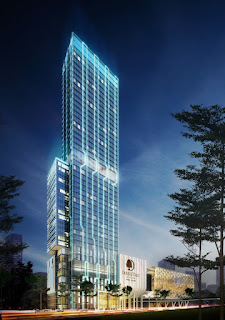 With an estimated gross development value (GDV) of RM124 million, the serviced residences will sit on top of the upcoming DoubleTree by Hilton, she told TheEdgeProperty.com. The hotel will occupy the ground floor to level 23 of the tower while the serviced residences will start from level 24 to level 42. The serviced residences, which has a working name of “Converse @ i-City” will comprise 200 fully furnished and IoT-ready units with built-up ranging from 480 to 880 sq ft. Prices start from RM480,000 per unit. In September 2016, the property developer partnered with Huawei to implement the smart city and IoT-ready home concept in i-City. Some of the enhancement features in Converse @ i-City are 100MB internet connectivity and thumb print door access to each residential unit, in addition to smart parking and traffic management control. “The serviced residences above DoubleTree by Hilton will be launched in June 2017, the target buyers are young professionals who value brand association and those ‘early tech adopters’,” said Ong, adding that the development is set to be completed in 2019 together with the hotel. As for the 23-storey DoubleTree by Hilton, the construction of the hotel started in 2016 and piling work is in progress, she said. “The concept follows that of Hilton Worldwide guidelines. However, this establishment will have enhanced state of the art technology — guest room management system for better guest experience,” she shared. With a gross development value (GDV) of RM250 million, DoubleTree by Hilton will offer 300 rooms, it is targeted to be opened in 2019. Ong said the emergence of DoubleTree by Hilton fits i-City’s development as both a real estate development and tourist destination. As i-City is an international business hub during the day and a lifestyle haven at night, DoubleTree by Hilton would cater to the demands of the business community and travellers who are attracted to the leisure activities in i-City, she continued. The Best Western Hotel is recording an average occupancy rate of more than 80% and I-Bhd is confident the response for DoubleTree by Hilton will be similar, she noted. “The Hilton group has recognised Shah Alam as one of the growth centres in the Klang Valley and the partnership with Hilton Worldwide will enable i-City to leverage on its expertise in providing hotel development and management services,” she said. Going forward, Ong pointed out that besides the serviced residences above DoubleTree by Hilton, there will be another launch by I-Bhd between November this year and the first quarter of 2018. Meanwhile, I-Bhd’s 8 Kia Peng in Kuala Lumpur has been recording a satisfactory take-up rate with most of the buyers being from the neighbouring countries, she added.